A 40-year-old woman had been followed as an outpatient to manage chronic kidney disease secondary to autosomal dominant polycystic kidney disease (ADPKD). Atrial premature contraction was found incidentally on an electrocardiogram during her regular follow-up examination. Subsequent transthoracic echocardiography detected an abnormal structure located very close to the left ventricular outflow tract (23 mm long × 15 mm wide in diastole). The structure was finally diagnosed as congenital left ventricular diverticulum (CLVD) using transesophageal echocardiography, contrast-enhanced computed tomography, and magnetic resonance imaging. Although CLVD occasionally causes intraventricular coagulation, lethal arrhythmia, and congestive heart failure, the size and location of her diverticulum remained unchanged over time and a 24-h Holter electrocardiogram showed no lethal arrhythmias. Accordingly, neither anticoagulation therapy nor surgical resection of the diverticulum was performed. To the best of our knowledge, ours is the first case of CLVD in a patient with ADPKD. Because gene abnormalities in polycystin coding are mechanistically related to the development of colonic diverticulum and abnormal cyst formation in ADPKD patients, we suspected that CLVD and abnormal cyst formation were related to the same gene abnormality in ADPKD. 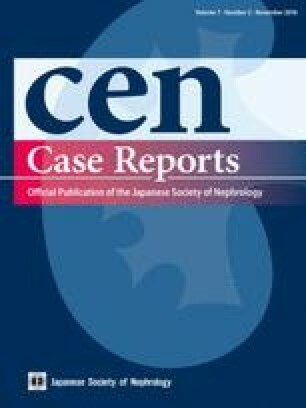 More case reports, case series studies, and basic research are required to determine whether CLVD in ADPKD is mechanistically associated with abnormal polycystin or just a coincidence. We thank Jane Charbonneau, DVM, from Edanz Group (http://www.edanzediting.com/ac) for editing a draft of this manuscript.